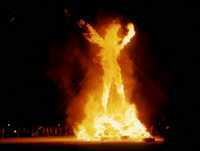 The Festival of the Burning Man is one of the most unique festivals in the world. Drawing crowds of more than 20,000 each year from all over the world, the celebration is of art, creativity, and humanity. Unlike most other festivals in the world, this one has no commerce, no shops, no rock stars, no rollercoasters. It is simply a gathering, albeit a very large one. The Black Rock Desert, two or three hours north of Reno is the setting. The serenity of the area allows festival goers to feel uninhibited. The emphasis is on community and people helping one another. On the last day, the bonfire of the Burning Man takes place, setting the skies alight in fire while the community dances around. Due to the non-commercial nature of the festival, those attending are advised to bring everything they might need with them. Check the official website for details.